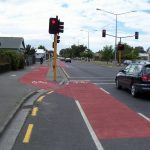 There’s been a lot of feedback over the years in Christchurch about trying to provide more separation between people cycling and driving, as per the many European examples we see bandied about. A lot of feedback in Share an Idea last year echoed this, and we’ve also had local NZTA research that demonstrated that potential cyclists rated best the facility designs that separate them the most from other road users. A trial is now underway in Christchurch to see what the effects of some of these separator devices are on road user behaviour. It’s a bit of a team effort: local consultancy ViaStrada are undertaking the research for VicRoads (roading agency in Victoria, Australia) with assistance from Chch City Council (for the sites) and the University of Canterbury (for some of the analysis). Kotare St, near Clyde Rd in Ilam has a fairly tight lefthand corner where motorists often cut the corner. 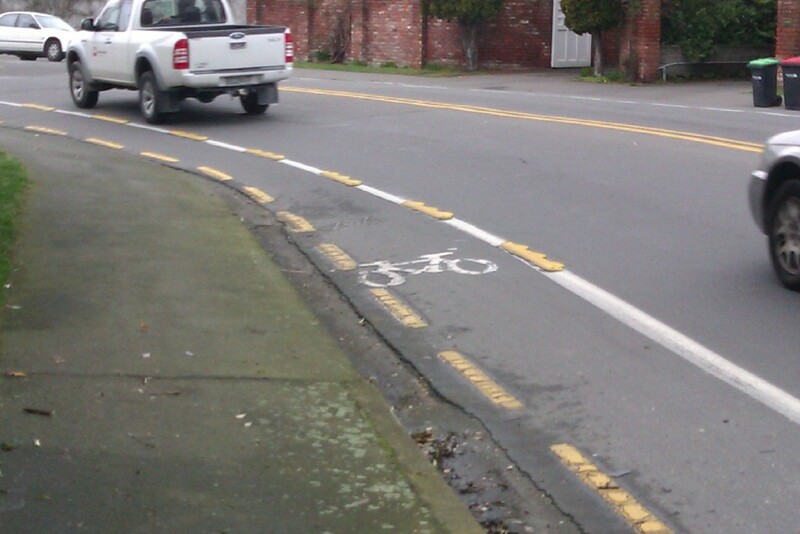 So separators have been placed around the inside cycle lane. Strickland St, at Brougham St in Sydenham has a cycle lane approaching the traffic lights where left-turning motorists often squeeze in before turning. The sites have started out with just a series of raised yellow “rumble strips”; some vertical posts might be installed as well later. Video monitoring and other observation data is being collected to determine what effect (if any) the separator devices have. Other practical issues like visibility, safety, and maintenance are also being looked at. Christchurch isn’t the first place to try out these in New Zealand. Timaru, Lower Hutt and Auckland at least have also had a go at some options to put a little distance between parties. Now different locations will probably require different solutions, and the relatively inexpensive option for one place may not work somewhere else and require a more costly treatment. Hopefully the research can start to see what works for places like Christchurch. What do you think of these types of devices? Do you think they help to make cycling a friendlier activity around town? ViaStrada would love to have any feedback of your experiences with these trials. In Holland cycle lanes and road are often separated by a berm ( http://www.duurzameenergiethuis.nl/wp-content/uploads/2011/01/fietspad.jpg ). In the city centres cycle lanes are often separated from the road by parked cars (with a space between lane and road to allow for opening doors) Raised barriers along the road are also used a lot. Generally there are not a lot of cycling safety concerns as most drivers are cyclists too….I have lived over 30 yrs in Holland and can not remember ever witnessing a cycle accident. I am in favour of these types of separators, probably the least intrusive ones foremost. I’m quite impressed with the pictures of what’s starting to be rolled out in Auckland. I think it’s quite important that the separators don’t prevent cyclists from using the optimum route. The Kotare St example looks like I’d be forced to be closer to the kerb than I’d like to be. There’s not much room to avoid debris, potholes, etc. But it certainly looks like a simple way to give cyclists more confidence that a cycle lane is offering some protection. encouragement. Many of the road markings added in recent years have been very helpful. The Marshland Road / QE II drive intersection re-development completed recently is now very good for cycle traffic heading east/west. There is a long way to go , but every little bit helps . Better still would have been an underpass underneath Marshlands Road, like the rather under-used but brilliantly cheap option made of shipping containers for Hills Road passing under QEII Drive. Sorry, these options just don’t make the grade. Separate cycle lanes means just that. To encourage cyclists back on their bikes we need cycleways that aren’t just stuck on the side of roads.